Comments: Breeding adults have a black neck and dark back and sides. Golden, wispy feathers fan out behind their eyes. Winter birds have dark cheeks, nape and back and a variable dusky throat and neck. Heads have a “peaked” appearance over the eye. The bill is longer, thinner, pointed upward at the tip and lacks the white tip of Horned Grebes. Eared Grebes nest in the northern Great Plains and western states. These large colonies may include over 1,000 pairs of Eared Grebes. They primarily winter in the Gulf of California and occasionally off the coast of Texas. They migrate mostly through the arid west where they use saline wetlands. 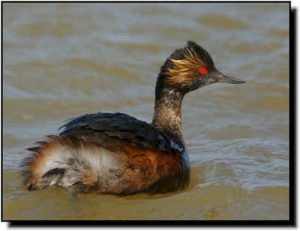 Eared Grebes go through several unique physiological changes. In the fall they molt, double their body mass and their flight muscles atrophy. Following this, they quickly increase heart size and metabolize fat to make a nonstop flight to wintering sites. Flightless periods may total 9-10 months each year.